NEW FLATSCREEN HI-DEF TV's (Not shown). Large (Apx.2700-sf), two level home, Pool and new $10,000 Hot Tub! 4 bedrooms, 2 1/2 baths, INCLUDES 2 KING MASTERS...ONE UP, AND ONE DOWN WITH A FIREPLACE, plus a queen bedroom, a bedroom with 2 twins, a sofa sleeper (queen) in the living room, and a queen sofa sleeper in the downstairs master. The living room also offers a large loveseat with 2 built in recliners, a big easy chair recliner.Home has Five TV's, DVD, Fantastic lake and mountain views from the deck outside your dining area, and from the outside upper deck, complete with dining area and pass thru kitchen window! Sitting area in the downstairs master bedroom...also a gorgeous Southwest style beehive fireplace...a king bed, TV and DVD. Good sized game room - includes professional pool table, video karaoke machine, TV/VCR, Large, heated pool, lots of cool deck, lounges and chairs. Gas BBQ, two car garage. Ample RV and/or boat parking. Located on the prestigious South side of town. Outside is your own professional horseshoe pit. The Rich and Famous Home...: The rich and famous have rented this home, including the MTV network who filmed at the home, the number one Polaris Watercraft pilot from Europe, authors, and the maker of the exclusive 'J.D. Power & Associates Award'...the beautiful beveled glass award you see on TV all the time. Most recently, the Captain and Chief Engineer of the two Warner Bros. Gulfstream 5 Luxury Corporate Jets. Lake Havasu City and Surrounding Area: Close to: Las Vegas, Nevada / Laughlin, Nevada / Needles, California /Parker, Arizona. Lake Havasu City, Arizona, USA is a very unique area that offers a 23 mile long lake with great fishing, swimming and boating...it is so clean that California gets its drinking water from it. To boot, they brought in THE ACTUAL London Bridge (yes, the one we used to sing about!). Also, some of the most spectacular scenery in the world is located 'down lake' from us a few miles...past the Parker Dam,the twisting and turning of the mighty Colorado River has etched its way into the land, creating some unbelievably beautiful canyons and high mountain backdrops, as it meanders along golf courses, camp sites, quaint marinas and happy vacationers en route. (Slot machine for fun purposes only). Note: Regarding our personal website, some items and features have been discontinued however some items have been added such as pianos in some homes, Most homes have flat screen tv's and all homes have upgraded hot tubs/spas. WINTER VISITORS: If you're interested in booking the month of February we will only book it if you begin your reservation by November 1st or December 1st or prior. If this fits your needs please make an inquiry by clicking on "Ask the owner a question" Link. english, spanish, Conversational Spanish, Vietnamese, Tagalog, Farsi. Just a hardworking guy, trying to please my guests. If you ask for more information...I may never stop talking. Unique million-dollar feel. Spacious, great outside areas. Tremendous character. Add to photos...a BBQ pit and a fantastic large, $10,000 newer hot tub!! (Not Shown). Home is about 4 minutes to the lake. toilet, shower, His 'n Hers vanities. toilet, 1/2 Bath off the Downstairs Master...toilet, vanity. Master bath has been recently redone. About a 4 min drive to the heart of the City. Resort environment. Near London Bridge Resort and Queen's Village! London Bridge Village is 4 minutes away. Beautiful views of Cup Cake Peak, and Mountains. One unit in upper floor with thermostat, and a separate unit with thermostat downstairs. There is a beehive Navajo style fireplace in the downstairs Master bedroom. Lots of parking on driveway, front gravel area, side gravel area. Optional high speed WIFI...please inquire. Downstairs there is fitness equipment in cubby hole at lower bath area...bring 'em out and use 'em in the game room area. Comfortable living room looks onto front courtyard area., sofa bed, recliners, ..piano, loveseat, flat screen TV, tables, etc. Regular coffee maker and a Keurig-type coffee machine. Some flat screens included...a TV in every bedroom, and the living room, of course. Expensive regulation sized pool table in game room, lower floor...looks out onto lower deck and pool area. Desert scape with 4 palms in back yard...rock garden, horse shoes. 4 courses nearby..one within 6 blocks. A $10,000 Hot Spring Hot Tub was recently installed...on the lower deck. Internet...WiFi is available for a small fee..please ask. Should you need anything for the home, please ask! We are here TO PLEASE YOU! The Staff. Room Tax may apply. Professional Horseshoe pit in large 'palms' back yard area. OMG, Ken...You have absolutely MADE MY DAY...and the CREW'S DAY TOO!! What a generous and kind review. It makes me so very happy...we will try even harder to please our guests! You are a very special person to have communicated with me as you did...I can tell. And of course, you are always welcome! Terry was great! The house is awesome! Lots of room for large groups. I will definitely be renting this house again. Enjoyed the view of the water. Kids loved the pool table and piano. Was able to call the owner and he helped us right away. House was very clean when we arrived and ac was a comfortable temp when we got there. Again Suzanne thank you so very much. This rental was built and furnished in the 70’s. It is in desperate need for a rejuvenation. Cons; pool in terrible shape, plaster and paint flaking off with black algae, BBQ was found filthy, cigarette butts in outside ashtrays, furniture old, bedding old, toilets broken, weed growth all around pool area to mention a few. Pros; AC worked well. Owner wanted to cap electricity, I would not agree. Owner wanted long contract signed, with Credit Card info, would not agree. I could go on and on. I’ll find something in a little better shape next time, as should you. We are in process of redoing much of the home...including pool resurfacing...cannot do that until Oct due to heat. Kitchen cabinets etc will be replaced. We tried so hard to please you with all we had. This home is what we would call the Hollywood Glam home! Lots of bedrooms with awesome fireplace in second master. With four bedrooms, the layout is great for a large group with three bedroom areas for privacy. The pool is huge and the view of Cupcake Mountain is up front and personal. The decks are lovely and the hot tub was new and the lighting was relaxing. 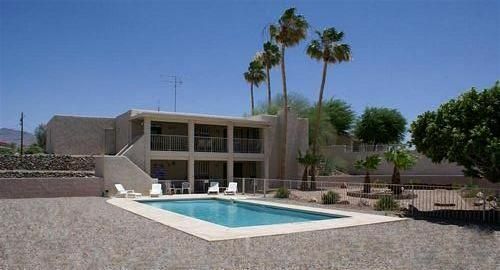 The neighborhood is quiet, the location is easy access to all Havasu has to offer and the back yard is private. Horseshoe pit was fun as was the pool table. For a vintage Hollywood Glam stay, this is the house! And Terry, the owner, is easy and pleasant to work with. Thanks for the stay, Terry! Terry was very helpful and accomadating. Property had everything we needed and great entertainment to have a wonderful vacation. Close to: Las Vegas, Nevada / Laughlin, Nevada / Needles, California /Parker, Arizona. Vegas is 2 1/2 hours Northwest. The Colorado River town of Laughlin is only about 1 hour Northwest. Other Activities: Strolling under the London Bridge...marina,shops, ice cream, etc! Also, Aquatics Center with waterslide nearby...AND YOUR OWN HORSESHOE PIT! Ask about NOV and DEC lower rates!! Must ask upon initial inquiry! Cleaning fee can vary.. Holiday rates and minimum stays can vary. Lesser rates and lesser minimum stays for midweek rentals. Cap on electric. New hot Tub not shown. WIFI available...please inquire.